Tokyo (VNA) – Prime Minister Nguyen Xuan Phuc and his Japanese counterpart Shinzo Abe held talks in Tokyo on May 28 following a welcome ceremony for the Vietnamese PM. The two leaders compared notes and reached high consensus on major orientations and specific measures to develop the Vietnam-Japan extensive strategic partnership in a comprehensive, pragmatic and more effective manner in the time ahead. They expressed their delight at the strong and substantive developments in the bilateral cooperation over the past years, especially in economy, agriculture and exchanges between localities. PM Nguyen Xuan Phuc congratulated Japan on its successful organisation of the G7 Summit and the expanded G7 Summit. 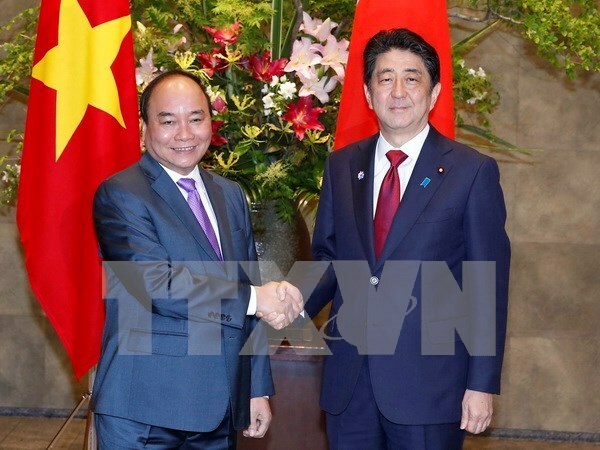 He affirmed Vietnam’s consistent policy of regarding Japan as a leading and long-term partner. For his part, PM Shinzo Abe congratulated Nguyen Xuan Phuc on his new post as head of the Vietnamese Government. He extended thanks to PM Nguyen Xuan Phuc for attending the expanded G7 Summit, and applauded the Vietnamese Government leader’s speech delivered at the event. Japan attaches importance to the relationship with Vietnam and wishes to continue closely cooperating with the country in order to push forward the bilateral ties in a more comprehensive fashion, he said. The two PMs agreed to boost political trust by maintaining regular exchanges of high-ranking delegations and meetings on the sideline of international forums, and by enhancing the efficiency of bilateral dialogue mechanisms. They said they will reinforce defence and security cooperation, particularly in dealing with war-aftermath and UN peacekeeping missions. Abe said he hopes to revisit Vietnam soon. Both sides also agreed to seek specific measures to promote connectivity between the two economies in terms of economic strategies, production resources and human resources via investment and trade cooperation and official development assistance (ODA). PM Shinzo Abe stated Japan will continue offering ODA for Vietnam’s infrastructure development and climate change response. He said Japan will work closely with Vietnam in implementing an initiative on boosting Japan-Mekong link and a 110-billion-USD credit plan to develop high-quality infrastructure in Asia. PM Nguyen Xuan Phuc called for Japan’s support for Vietnam accessing preferential loans from international financial organisations, including those from the World Bank’s International Development Association after 2017. The two sides agreed to boost Japan’s investment in Vietnam via the implementation of Phase VI of the Vietnam-Japan Joint Initiative in 2016. They pledged close cooperation in the implementation of Vietnam’s Industrialisation Strategy within the framework of the Vietnam-Japan cooperation until 2020 with a vision to 2030, and acceleration of big projects on infrastructure, including the North-South Highway and the Ninh Thuan 2 Nuclear Power Plant. The two sides discussed measures to promote the cooperation in trade and hi-tech agriculture, and create conditions for each other’s agri-products to enter the other’s market. The two sides also reached agreement on enhancing cooperation in health, the training of human resources and Japan’s reception of Vietnamese trainees, while continuing to implement the Vietnam-Japan University project as well as bolstering tourism and people-to-people exchanges. Concerning climate change, PM Shinzo Abe announced a non-refundable aid worth 300 million JPY (2.5 million USD) to assist Vietnam in dealing with drought and salt water intrusion. He affirmed Japan will work with Vietnam to seek medium and long term solutions to those problems, adding that Japan is ready to provide official development assistance capital to build dams and reservoirs based on specific requests from Vietnam. In the immediate future, Japan will send JICA’s experts to conduct surveys under the Water Management Project in Ben Tre province. Discussing international and regional issues of common concern, PM Shinzo Abe affirmed Japan would coordinate with Vietnam in the preparation for the APEC Year in 2017. The two sides shared the international community’s deep concerns on East Sea situation in recent time, particularly the large-scale artificial build-up. They agreed on the importance of ensuring peace, security, safety and freedom of maritime and aviation in the East Sea. The relevant sides should not take actions changing the status quo or further complicating and expanding disputes and militarizing in the East Sea, the two PMs said, stressing that disputes should be solved via peaceful measures on the basis of respect for diplomatic and legal procedures, full observance of international law, including the United Nations Convention on the Law of the Sea ( UNCLOS ) and the Declaration on the Conduct of Parties in the East Sea ( DOC ) while striving for the early formation of a Code of Conduct ( COC ) in the East Sea. After the talks, the two PM witnessed the exchange of five cooperation documents, of which four are on ODA loans worth a total of 166 billion JPY (1.5 billion USD) for the urban railway No1 in Ho Chi Minh City, the Thai Binh thermoelectricity plant; the second phase of Ho Chi Minh City’s water environment improvement work. The fifth document is a stock purchase agreement between the Vietnam Airlines and Japan’s ANA Holdings Inc. The two leaders then met with the media on the outcomes of their talks. On the same day, PM Nguyen Xuan Phuc received officials of some Japan’s organisations and businesses including Chairman of the Japan International Cooperation Agency Shinichi Kitaoka, Honorary Chairman of the Mitsubishi Group Kojima Yorihiko, and Governor of Aichi Prefecture Hideaki Omura. He also visited Yokoyama farm in Aichi Prefecture.